3 - 4.............Jago von Beelen. 4 - 4,5,5.......Chico von Forell. 4 - 5.............Dascha von Forell. 4 - 5.............Miko von Fürstenfeld. 4 - 5.............Iris von Ellendonk. 4 - 5.............Gero vom Ellendonk. 5 - 5.............Odin von Forell. 1992: 100-91-88	= 279 points (2nd). 1990: 95-92-93 = 280 points (1st). Kid vom Holzbergerhof was runner-up at the working 'World Dobermann Cup' (W.D.C.) in 1992 with 279 points and the winner of the working 'Belgische Dobermann Club Belge' (B.D.C.B.) 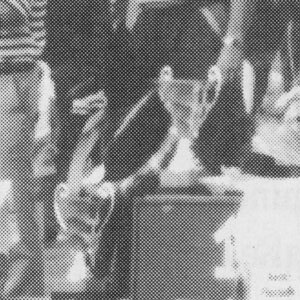 Meisterschaft in 1990 with 280 points. His sire, Arco von der Weyermühle, competed in the D.V. Meisterschaft in 1986 and passed the Körung 'for life' with highest rating for hardness, courage and working drives. Kid's maternal grand-sire, Ilo vom Kirchbühl, passed the Körung 'for life' with highest possible rating for hardness, courage and working drives while his maternal grand-dam, Mira vom Eschenhof, was the winner of the working 'Belgische Dobermann Club Belge' (B.D.C.B.) Meisterschaft in 1980 with 290 points.